On behalf of admin of JML Law, A Professional Law Corporation posted in Motorcycle Accident on Saturday, Jan 06 2018. Off-roading may seem like a fun experience, but there’s a major dark side to it. If you bought an off-road vehicle such as UTV or ATV – or even a motorcycle – for your child under 16 as a Christmas present, you may want to take it back. And it’s not because that thing was abnormally expensive and you began second-guessing your decision, it’s because your under-16 child is at great risk of injury and death when off-roading. Fact: between 25 and 50 percent of all off-road-related deaths involve a child under 16. Experts argue that riding an off-road vehicle is much more dangerous than riding a bike along a busy street full of cars and trucks. That’s why our accident attorneys at JML Law have prepared a handy guide to staying safe when riding off-road vehicles in Riverside and elsewhere in California. Even following all safety rules during off-roading may not save you from all the dangers and troubles associated with driving off-road vehicles. Let’s look at the statistics of accidents involving off-road vehicles. Each year, hundreds of people die in fatal off-road crashes. One such death occurred in Riverside when a 39-year-old man was killed after being ejected from his off-road motorcycle in the Ocotillo Wells desert. Investigators concluded that the crash, which occurred at about 11 am in late December, was caused by two sand dunes. The Riverside County rider, driving his Kawasaki KLX 450R motorcycle, lost control of the off-road vehicle after it struck the first sand dune. Then, the motorcyclist – driving at an unknown rate of speed – struck the second sand dune while struggling to regain control of the dirt bike. Hitting the second sand dune caused the off-road vehicle to go airborne and threw the rider off the bike. The Riverside man suffered fatal injuries after landing in a field of dirt and rocks. The victim was driving along Ocotillo Wells, an 85,000-acre desert operated by California State Parks. The desert attracts many fans of extreme sports largely thanks to its sand dune recreation area. 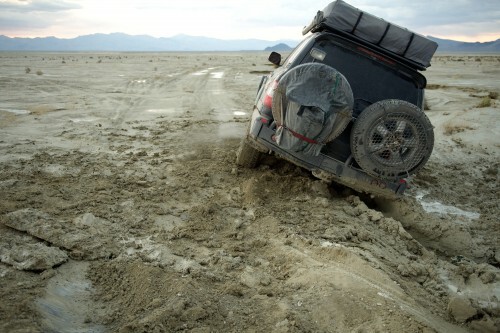 Fact: an estimated 100,000 people require hospitalization to treat off-roading-related injuries. Getting ejected from an off-road vehicle is only one of the many dangers of riding such vehicles on off-road terrain. Other dangers include rollovers, performing stunts, inexperienced driving, and operating in unfamiliar areas or terrain. Off-roading vehicles include not only dirt bikes, but also SUVs, UTVs and ATVs, all of which are at a greater risk of rollover when driving on unstable, off-road terrain, our Riverside motor vehicle accident attorneys warn. Fact: a study has found that two-wheeled vehicles are actually safer than four-wheelers in off-riding riding and racing. Sand dunes and another rough terrain often lead to failure to maintain control of the vehicle and cause it to go airborne, which may throw the rider off the vehicle. If you’re a parent of a child under 16, do NOT buy him/her an off-road vehicle for riding and racing, as children under 16 are at a larger risk of injury and death in off-road accidents. Take a hands-on safety training course before off-roading. If you have followed the above-mentioned safety precautions in off-roading but still got injured in a single-vehicle off-road accident, you may be entitled to compensation for your injuries and damages. If the accident was caused by uneven terrain, and the owner of the property (private owner, city or locality) is responsible for providing a safe environment, you may be able to seek justice by suing the responsible parties. Consult our best motor vehicle lawyers in Riverside at JML Law to launch an independent investigation into your particular claim and determine liability. Call our Riverside offices at 818-610-8800 or send an email for a free case evaluation.